We receive a lot of inquiries over the years asking if hair transplant will be as effective for older people and whether it is advisable to proceed with the procedure after someone has reached a certain age. Here’s a before and after result for a 60 year old patient. Of course, there is no guarantee that every 60 year old will attain the same coverage and results. There are a lot of factors that can affect the outcome of the result. Also it is a surgical procedure after all, results will vary from patient to patient and there is no guarantee even under the best circumstances. It is important that anyone considering hair transplant do very thorough research via as many channels as possible before making a decision. 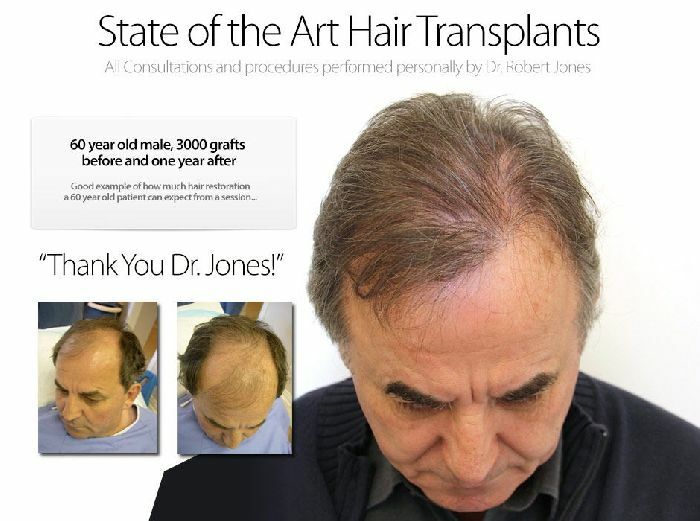 For a free no obligation consultation to see if you are a good candidate for hair transplant, treatment option, procedure details and the approximate cost, email info@drrobertjones.com, please include your age and the degree of your hair loss. You may also attach photos.